Its officially September, but I dont want to let go of summer food just yet. This summer has been filled with BBQs, grilled meats and veggies and it was always fresh and delicious. While I like fall for its comfortable temperatures and outfits (sidenote: I am at my trendiest in fall when I get to wear a leather jacket and boots. Throw on anything with that and its a quote unquote cool) I just love summertime tomatoes. 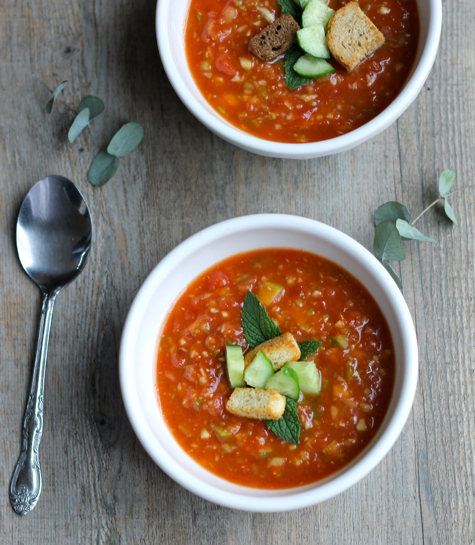 So I will just have to scoop up the remaining fresh farm tomatoes in the markets and make batches of this soup to enjoy for the next while. Cause its delicious. 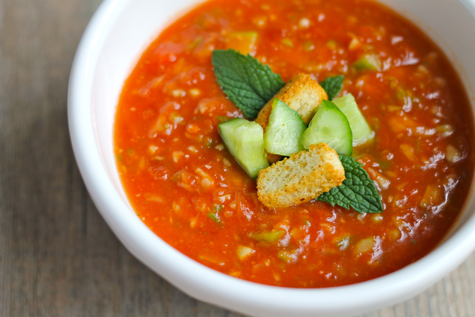 While I have had gazpacho in many restaurants, this recipe from my mother is always my favorite. Its even better when she makes a batch and sends me home with a container full to last me a week! Thanks Mom! In the food processor: process cucumber in pulses until finely chopped. Remove to a large bowl. Repeat with green pepper, onion and tomatoes, removing each one to the large bowl. Process together the minced garlic, lemon juice, chili powder, basil, oregano, salt and 1/2 the tomato juice. Process until smooth. In the large bowl, add to this mixture to the chopped vegetables and the remaining tomato juice. Add salt and pepper and tabasco to taste.